Any inquiry please message me for wholesale or special price for multiple or bulk purchases. IF YOU HAVE ANY PROBLEMS, PLEASE CONTACT US. PLEASE DO NOT OPEN CASE AS WE WILL SOLVE ALL YOUR ISSUES. 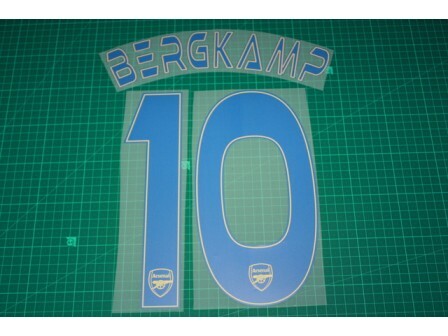 If you need other Players Name and Number, please tell us, we can make it for you, thank you. 1) Place the Patch / Badges glueside (rough side) down on the shirt in correct position. 5) Peel: Cold (allow to cool for at least 60 seconds before carefully peeling the backing material). 6) If Patch / Badges does not fully stick, recover and press for a further 5-10 seconds. Tracking numbers will be updated in paypal after item is shipped and customer should receive the email from paypal to confirm the tracking numbers. Any problems, please contact us. All our item will be shipped to buyer's paypal address. Please confirm your address on paypal before you buy it. eCheque will be held until cleared. All products are shipped out with 100% checking for quality, if you do not like the item, it can be shipped back and exchanges or refund within 14 days of purchase. All questions will be answered within 48 hours, Please contact us if you have any issues. Don't open any complain claim case without message to us, otherwise, we will add you to our blocking list, we never do any business with you. thank you for your co-operation.